A collaborative team from four universities, government agencies, industry partners, grower groups and commercial providers have developed a new interactive web map of horticulture tree crops across Australia. Launched by the Assistant Minister for Agriculture and Water Resources, Senator Anne Rushton, the Australian Tree Crop Rapid Response Map provides stakeholders and growers from the mango, avocado and macadamia industries the first opportunity to see the location and area of commercial (>2 hectares) mango, avocado and macadamia orchards across Australia. The mapping is accessible from any desktop or mobile device web browser and does not require a user account or subscription. It uses coloured polygons to identify horticulture tree crops (mangoes, avocados and macadamias), on the base satellite imagery. It was formulated using satellite imagery together with industry and government data, regional surveys and on-ground validation. The mapping will be used by industry to develop a better understanding of changes in growing areas, grower demographics, cultivars used and regional variations in production and quality. The information supports improved marketing and decision-making, and informs improved biosecurity and pre and post natural disaster planning, response and monitoring. For example, in the event of a pest or disease outbreak industry groups can access the map and know exactly where surrounding crops are and quickly develop management strategies for containment. The product can also be used following natural disasters like floods and cyclones and speed up applications for recovery assistance. In fact, the map has already proven useful following the devastating Tropical Cyclone Debbie which crossed the Queensland coast on Tuesday 28 March 2017. The map is also presented in an interactive web app that summarises the area (hectares) of each commodity within the map extent. Panning and zooming the map extent will update the statistics on-the-fly. Users can also search for a place of interest, and optionally switch the background display to see other basemaps (for example streets or topography). Search www.arcgis.com for Australian Tree Crop Rapid Response Map. The Web Map is the first component of Australia’s National Tree Project, an ambitious project that combines innovative technologies such as satellite mapping, laser scanning and on-ground robotics with citizen science apps to deliver improved industry information and methods of monitoring tree health, productivity and quality. The National Tree Project is funded through the Australian Government’s Rural Research and Development for Profit program, managed by Horticulture Innovation Australia Ltd and coordinated by the University of New England. 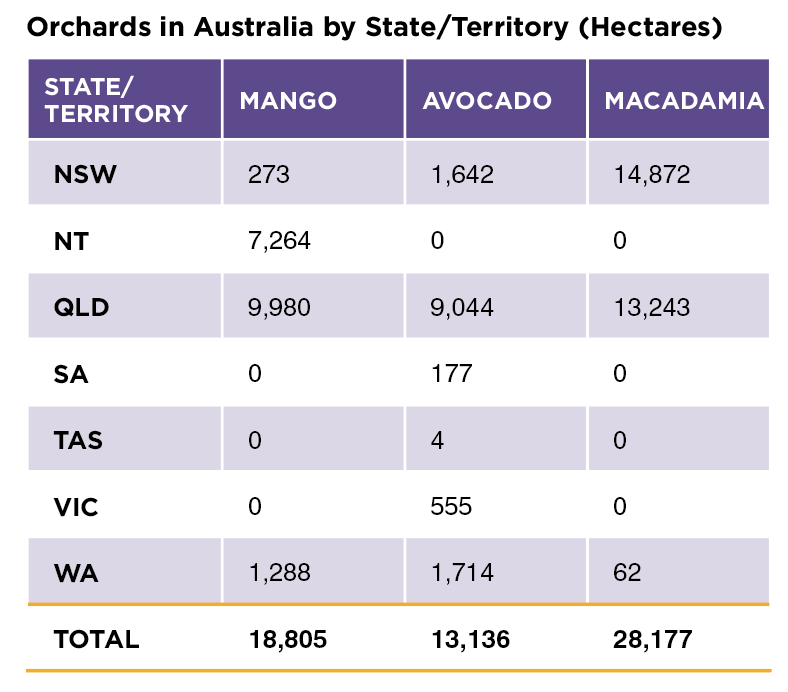 The success of the project can be attributed to the multi-disciplinary team from industry, research/academia and government, including The University of Queensland, University of Sydney, Central Queensland University, Agtrix Pty Ltd, the Queensland Department of Agriculture and Fisheries, Queensland Department of Science, Information Technology and Innovation, Simpson Farms Pty Ltd, Australian Mango Industry Association, Avocados Australia, and Australian Macadamia Society. A unique whole industry view. This new map allows growers to help safeguard the future of their industries by pin-pointing where farms are. For example, it provides important contextual information for growers, industry bodies and relevant agencies involved in biosecurity planning and response. It provides valuable input to natural disaster recovery. By overlaying storm track or tropical cyclone trajectory information onto the map, relevant authorities and industry bodies can quickly identify which farms were affected post event. A brave future for emerging Australian crop monitoring technology. A host more work is underway as part of this project including using robots to monitor and measure orchards, employing new technology, including drones, to help identify disease through heat stress sensing, and deriving yield maps from satellite imagery. The best use of the map will be your idea! The full value of this information can be realised when it’s combined with other spatial data—for example soils, climate, market, etc. This information can ‘spatially’ inform decision making and form the basis of industry scale business cases. Cross-sector collaboration is the key. The success of this map shows what can be achieved when growers, industry, academia, commercial organisations and government agencies work together.